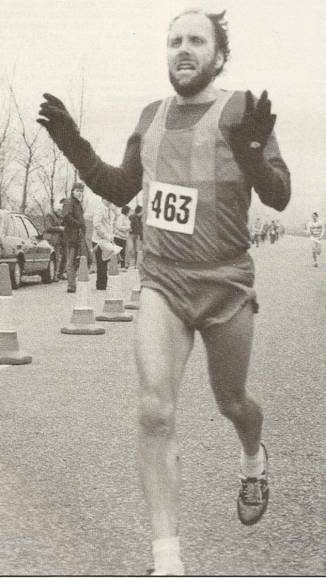 Several of the top marathon men not only in Scotland but around the world started their marathon career only after a background involving lots of conditioning and then a period of fast running on the track – Allister Hutton for example. Lawrie Spence must be among the best ever Scottish examples of this pattern. Starting as a boy in Greenock Glenpark Harriers and based in the South West District of the Cross Country Union he won the District title every year from first year Senior Boy through to Senior Man and then went on to win the West District Senior Championship three times after his move to Shettleston Harriers. He also medalled in every age group in the National Championships – the only other marathon runner to do so was Mike Ryan who was third in the Mexico Olympics marathon in 1968. In addition he ran for the Junior Scottish team in the last Cross Country International in 1972 and for the Senior team no fewer than eight times He also took over from Jim Alder as the Scottish Team Captain. These are summarised in the table below: the first three columns are the Cross Country titles won, the second three columns (in blue) detail the International appearances. (As in all tables in this section, placed runs in championships such as his second in the Scottish Junior Cross in 1969 and medals in team races have been omitted as there are so many of them). His track history built on this and is no less illustrious. Most track runners would have been happy to be in one Scottish all time list at their specialist distance but Lawrie is in no fewer than six. 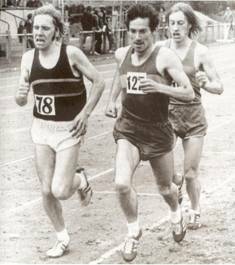 He has also won track championships at Scottish level: The SAAA Junior 1500 metres title in 1972 in 3:57.8; the SAAA Senior 1500 metres title in 1973 in 3:47.6 and in 1975 in 3:47.3 ; the SAAA 5000 metres title twice in 1978 in 13:45.0 and again in 1981 and the 10000 metres title three times in 1982 in 29:38.1, 1983 in 28:38.9 and 1984 in 29:18.3. Although not winning a UK title he won silver in 1983 and bronze in 1981 for 10000 metres. In 1971 he was ranked top Scot for 3000 metres in 7:52.82. Let’s have a look at his appearances in the Scottish All Time Best Performances list. I can’t think of another Scottish marathon man who has run sub four for the Mile. He also held the Scottish record for 2000 metres with 5:20.8 which he set at Airdrie in 1975 and then lowered to 5:12.8 in 1976 at the same venue. His current pb (set in Belfast when beating Rod Dixon the 1972 Bronze 1500 metres and 1983 New York marathon winner in a new All Ireland record of 5:03.8) although not eligible for a Scottish Native Record is actually faster than Frank Clement’s record of 5:03.5 set in 1978. In addition his 10000 metres time noted below is only 0.15 seconds slower than Lachie Stewart’s record of 1970. A track pedigree to be eminently proud of! The table summarises the personal bests and their all time rankings in Scotland and England – I have added the marathon best and the asterisk at the GB Marathon ranking indicates that it was arrived at by adding one to the UK Athletics rankings which stopped at position 151 on 2:16:00, just stopping short by one second of Lawrie’s mark Positions as at the start of April 2010. Lawrie’s own story of the Sub-Four Mile can be read at the SATS website – www.scotstats.com – just visit the site and go to the BLOG section. The bare bones of his marathon career are as follows: He ran five marathons in all over a three year period. He ran his first marathon in Glasgow in 1983 where he hit the wall and walked in to finish in 2:42:12 but the following year got it right when he finished third in 2:16:01 having learned the lesson of the previous year. In 1985 he started with an excellent 2:19:11 (fifth in Scotland and fifty eighth in the UK) which he set in Perth, Western Australia. His faster marathon was in Orange County, Los Angeles when he ran 2:15:03 but the course was never certified and ended up being a one off event and so doesn’t count! By 1986 he had it down to 2:17:01 which he set in London and brought him up to number five in Scotland for the year. Having found the Scottish Marathon Club questionnaire very useful in the past, I used IT to put some questions to Lawrie about his running career and specifically about his marathon running. His replies are below in italics. How did you get into athletics in the beginning and were you coached? I was coached by my brother Jim who took me from the boys’ age groups through to senior international level.. During the break through years I was lucky to have Lachie Stewart as a mentor which gave me a great foundation in the sport. In the early eighties I had a spell with Stan Long who was Brendan Foster’s coach but due to him being based down in Gateshead, the distance proved to be difficult before the age of our modern communications like email and mobile phones. As time went by I became more in control of the detail of what was in the sessions and what the plans were to be, but always keeping Jim as a rock in my training. I do believe that you do have to have somebody at the different stages of your athletic career, and also others, almost a team for example to play the ‘good cop/bad cop’ when reviewing your performances and help to modify what is working and what is not. As I am now a coach myself, I try to be an athletes coach and not a coach of athletes, using my own experience to help them develop and minimise their mistakes. A jump now to the marathon years. Why did you run the first one – was it your own idea, were you talked into it, or what? As I progressed through the events of the 1500m, 5000m and 10000m the marathon was always a natural move for me and it was just a question of when I was going to do it. Do you think you came to the event too early, too late or just at the right time in your career? I don’t think I would have wanted to try the marathon any earlier than I did. Even when I did, on reflection, I don’t think I ever fully committed myself to the event in that I wanted to still be able to compete on the track and therefore never did the miles of running that would maybe have allowed me to perform better and not suffered the aftermath of the recovery phase. I do have the thought of what really could my pb really have been? I know I underperformed in the marathon. What did you think was your best race (not always the same as the fastest)? As stated earlier, I don’t think I ever had a best one but my second Glasgow after having to walk the finish for my first one, gave me the most satisfaction as I was able to run it the whole way in 2:16:01 finishing third and first Scot and getting an engraved crystal vase for my efforts! My most enjoyable trip to one was to Perth, Western Australia. The reason for the trip was to go with my wife Ann to see my old training companion Duncan McAuley (who ran for Cambuslang when he lived in Scotland before emigrating) and his wife Fi.. We had spent many a session together and run together. His help in sessions was invaluable in my development and thereafter in my racing performances. That’s one of the best things about our sport: the friendships that you build up which last for ever – and they are “real” friends. Trevor Wright, the English internationalist, was racing and he also had his wife Rosemary (maiden name Stirling) who won gold for Scotland over 800 metres in the 1970 Commonwealth Games in Edinburgh but who was not running in the marathon. It always amazed me who I met throughout the world when I travelled to races. It was great to catch up with them. he race in Perth ended up a disaster at about the 19 mile mark in a pack of five when I went to grab my drink bottle from the tables, one of the other athletes also crossed, caught my heels and I fell skinning my arms and knees. I then did the classic of getting up too quickly and chasing after them like a bat out of hell as they had put the boot in when they saw me go down. I got back on to the back of the pack but was feeling uncomfortable as I sat for a while but the break was on after my fall and I then drifted off the back running on my own, feeling very sorry for myself with my grazed knees and elbows. It ended up being a long run back to the finish but passing one who was in a worse state than me to move up to fourth in the race but dropping valuable time which would have given me a PB over a hilly but very scenic course along the Swan River in Perth. Mind you, I did beat Trevor! It must be my first one in Glasgow. I hit the wall at 22 miles and was reduced to a walk and finished in 2:42. This international track runner who had been able to race half marathons well was caught out and given the message that the marathon is a unique event and demands respect. But I did finish the race as that was my whole make-up as an athlete – never drop out but finish and take it on the chin as you take the plaudits when you do well! Can you give some idea of your training? It was very much on 10,000 metres training with the speed sessions, fartlek runs and hill work depending on the time of year. My belief was, and still is, if you train slow then you race slow and vice versa. I increased my Sunday runs to over two hours and also tried to learn to take on water. The problem was being able to bring the pace down in these runs and not overcook and pay the penalty. I also increased the mileage in my other runs (not sessions) during the week and was hitting about 120 miles per week. Finally, what have you got out of running? Belief in myself, never lose your confidence and take the knocks and get on with it! I left school at 15 with no formal qualification and at best was getting a craft job in the Shipyards but through running giving me confidence in myself (I was one of the top boys in Scotland at the time) and learning the discipline of training I was able to go to night school and then day release and so able to get the qualifications to go to Strathclyde University, which in turn allowed me the opportunity to have a successful work career. Through hard work and dedication to the lifestyle and getting the success this brought with it, I moved onwards and upwards as a person.